The fourth annual United Solo Festival concluded it's eight-week-long lineup on November 24th 2013 at Theatre Row on West 42nd Street. The world's largest solo theatre festival offered more than 120 productions, all of them strictly one-man/ one-woman shows. Two other New Zealanders received awards at this festival : Arthur Meek for Best Non-Fiction Script, "Dark Stars", and Kirsty Cameron for Best Costume Design, "On The Upside Down of the World", performed by Laurel Devinie and also written by Arthur Meek. Linn's show, an original piece which depicts, in story and song, her adventures as a piano bar player in '80s New York has had two recent seasons at Edinburgh Fringe 2011 and 2012 and was a ThreeWeeks Edinburgh "Pick of the Festival". Intriguingly, her story covers the birth of her son Joseph Herscher, the young kinetic artist who is currently enjoying success in the US art-world with his eccentric "Rube Goldberg" machines. It's rare to catch a piano bar player whose fingers not only dance over keys, but who sings great, and spins a good yarn, weaving her personal histories of New York in the 80s around original and popular tunes. Kiwi Linn Lorkin bounces back and forth between the piano seat and center stage, bringing the audience closer and closer to her vagabond life and her extraordinary personality. Ms. Lorkin's connection to each song and her marvelous playing create a more authentic musical experience than is often seen in New York cabaret. In fact, she recently won best in cabaret at the fourth United Solo Theatre Festival -- but that's no surprise. Ms. Lorkin and her partner Herschel (jazz piano and accordion) play around the globe, and are especially loved at the Edinburgh Festival. With a little Piaf, a mop of fiery red hair and a grin Miley Cyrus would envy, Ms. Lorkin offers up an honest portrayal of an artist balancing out the demands of survival in a difficult profession. From the top, she makes it clear that she was a "sofa gal," not a woman who took to strange beds as she sang and played across Europe to hone her art. Still, there was much romance as she tries to count the many counts who fell under her spell. She sees magic in the small things like a song about a desired green down coat that is personal, yet universal, in that it touches the everyday objects that make up part of all of our lives. That Ms. Lorkin is also not a youngster adds to the depth of her performance. Her stories come from a life lived and relished, replete with all the joys and disappointments that un-lived lives cannot yet understand, let alone sing about. It's a pity she lives so far away, but a song about a picnic at a New Zealand beach is delightful -- naming all the relatives in a Danny Kaye sort of run-of-the-mouth. It's clear she's crazy about New York and her years here. I hope she comes back soon. 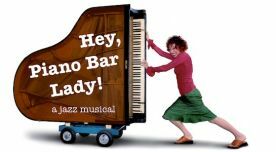 Hey, Piano Bar Lady! could be described as an autobiographical musical, a genre Linn Lorkin has made her own. Her hilarious and uplifting true stories are told in an exuberant raconteuse style and crystallise in equally exuberant songs with strong melodies and memorable lyrics.